I had discovered Ms. Garten’s shop in East Hampton, when visiting my aunt and late uncle’s place in nearby Amagansett in the mid-1980s. This was before her Food Network television fame, but I do remember the prices for her wonderful goods as being rather outrageous (it was the Hamptons, after all). I tried many of the Barefoot Contessa’s products from her shop, yet I do not recall having tried the brownie before I purchased her cookbook in the 1990s. Perhaps it was sold out at the shop. Who could not be tempted by such a name for a brownie? Outrageous! 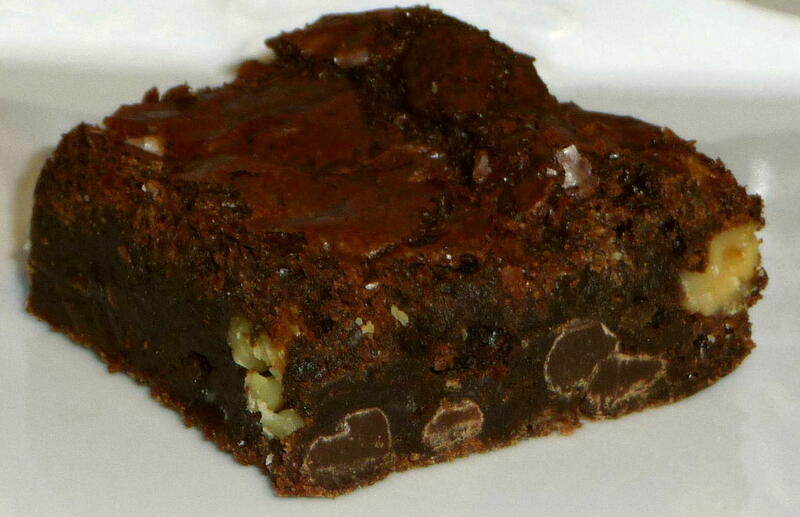 Whenever I make these brownies, people often start to moan when they try them for the first time. What more could you want as a reaction to something you have created? These are moans of delight, even if such guttural reactions can follow the disclosure of the amount of chocolate (more than two pounds) and butter (one pound) the recipe requires. 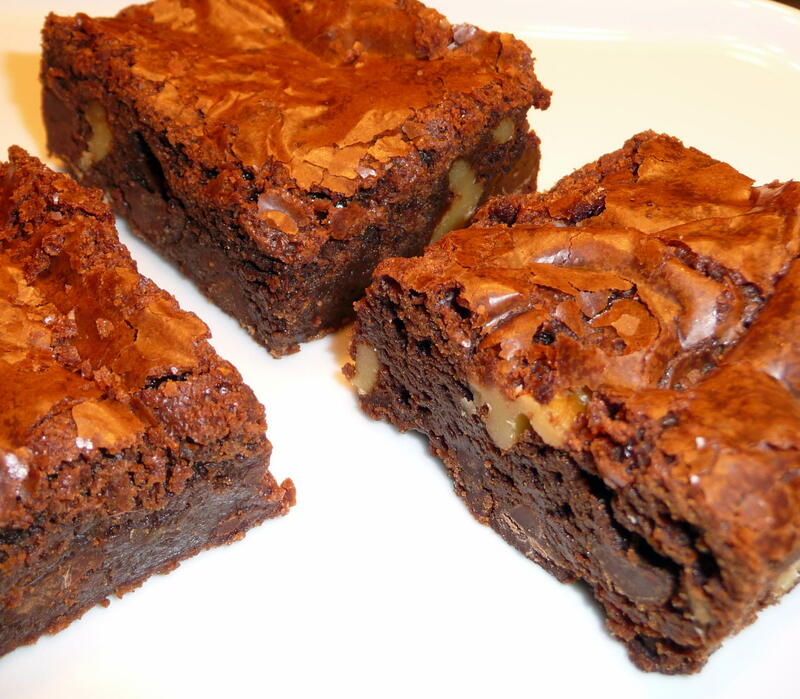 This is a very high-yielding recipe, I always like to point out, though my retort is usually ignored as the brownie-eaters focus on their second and third bites, which overwhelm their senses. Recently, I made these for an island potluck. One of the guests I met at this potluck wanted the “The Only Brownie Recipe You’ll Ever Need”, as she described it. So when you have the pot-luckin’ quandary of what to make, try this recipe for its outrageous fudgy-mocha profundity. Butter and flour a 12x18x1 inch baking sheet. chocolate in a medium bowl over simmering water (or use the microwave method, one minute, at a power level of about 40%, watching carefully,.stirring with a good silicone spatula, in between jolts, until just melted). In a medium bowl, sift together 1 c of flour, the baking powder, and salt. Add to the cooled chocolate mixture. then add them to the chocolate batter. Pour into the baking sheet. to force the air to escape from between the pan and dough. Bake for about 15 minutes or until a toothpick comes out clean. Do not overbake, as with any good brownie. the chips, or the chips will melt and ruin the brownies. and refrigerated. 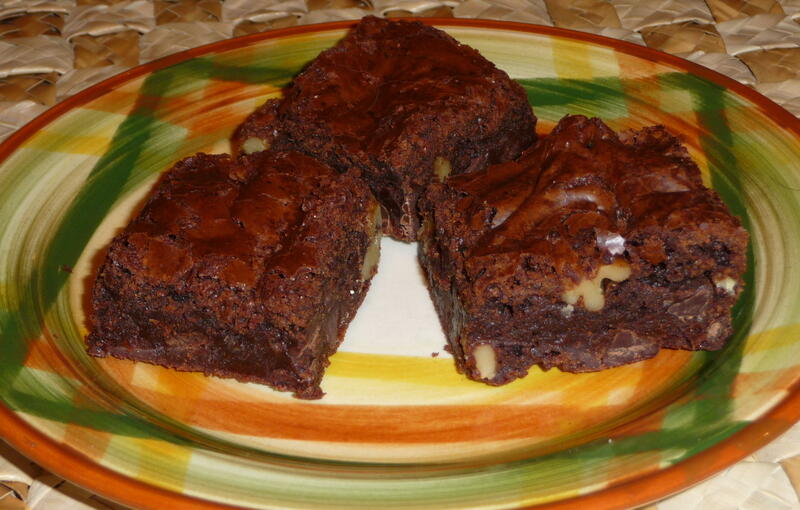 The brownies freeze well (for several months, as if they would last that long…). This entry was posted in Baking, Brownies, Dessert, Recipes Misc and tagged Baking, Brownies, Dessert, Recipe. Bookmark the permalink. I’ve made these and they are addictive. Thanks for dropping by my blog. Thank You for explaining why you flour the nuts and chips! These are yummy. I added hemp seeds! This paragraph posted at this web site is in fact pleasant. much more well-appreciated than you may be right now. You’re so intelligent. You realize thus significantly in the case of this topic, produced me individually imagine it from so many numerous angles. Its like women and men aren’t involved until it’s one thing to accomplish with Woman gaga! Your personal stuffs outstanding. Always maintain it up! I’ll right away grasp your rss as I can’t find your e-mail subscription link or newsletter service. If you would like to get a good deal from this post then you have to apply these techniques to your won webpage. and come with approximately all important infos.